The Perry Sandhills are named for George Perry, the first Land Commissioner to serve this area. Moorna Station, just past the Sandhills, was where the visiting dignitaries stayed whilst in the area – (Moorna was to become a new town and surveyor pegs are still able to be found on the property). The dunes are located just outside of Wentworth, (6km from PO), on the Old Renmark Road and are a unique land formation of continuously shifting sand dunes. The Pioneer Museum has good information which explains the early archaeological conditions in the area and how the dunes were formed. The archaeological ‘treasures’ indicate the area is of the same timeframe as Mungo National Park. However, the red sand of the region is highly fertile and with water available from the Darling and Murray Rivers, the district produces the grapes and citrus that Sunraysia became famous for when WW2 returned soldiers were granted small holdings of land. The Perry Sandhills have been the location of filming for many scenes from Australian and international films, including “The Man from Snowy River II”, “Burke & Wills”, “Flying Doctors” and “Boney”. The children’s television series, “Ocean Girl” and “Thunder Stone”, have utilised the Sandhills for scenes, and the dunes have been used for many television commercials and also music videos (including Slim Dusty’s ‘Looking Forward – Looking Back’). Located in the sand dunes is a magnificent Murray River Red Gum Tree (Eucalyptus camaldulensis), which is over 500 years old. Over time, the sand has completely covered the trunk of the tree (perhaps 15’ to 20’), so that you are able to stand in the canopy of this age-old tree – a magnificent sight! “The God Tree” is located on its own, slightly to the left of the driveway and over the first sand dune. From this point you get a great view of this remarkable area, only 5km from the confluence of Australia’s two greatest rivers, the Murray & Darling, yet you could be in the Sahara desert. 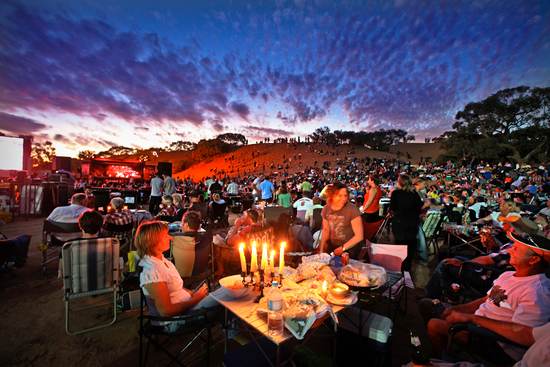 In previous years, the Sandhills have been the site for a very spectacular event, ‘Music Under the Stars’, featuring artists such as James Morrison, Grace Knight, Archie Roach and Ruby Hunter, Kate Ceberano, Ben Lee and Paul Kelly. 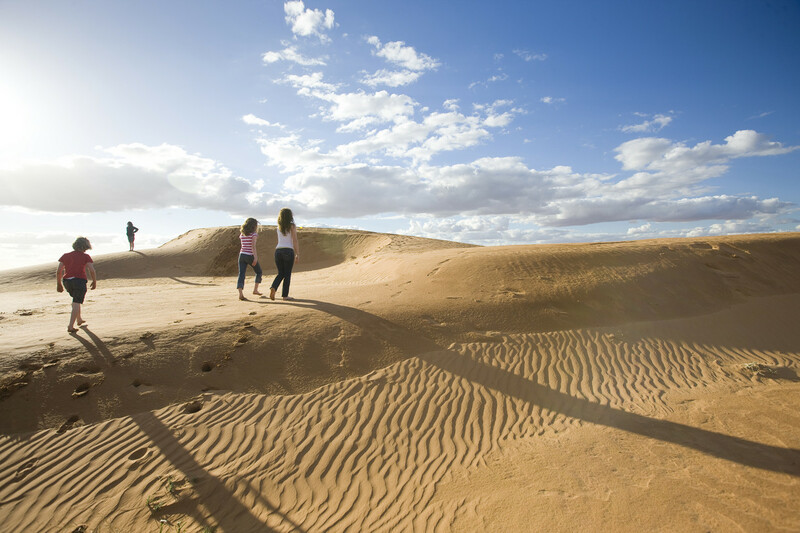 Be sure to explore these amazing red sandhills as they are a perfect location for a family picnic or outing; a FREE adventure park offering a great deal of fun for young and old alike! Feel the sand between your toes, tumble and slide down the rolling sands or simply sit and watch the sun set or rise over them; it’s magical!